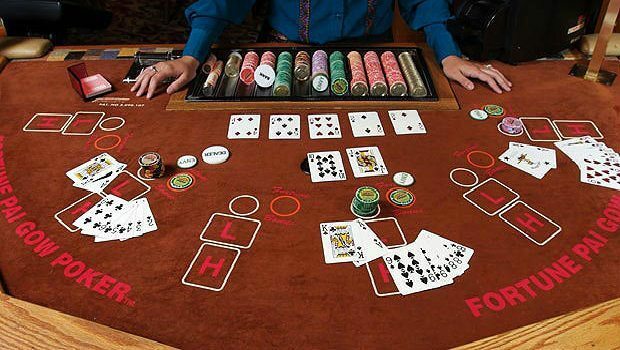 Originally dating back to the ancient Chinese game Pai Gow, once combined with the modern top-ranking casino card game poker, Pai Gow Poker became the next biggest thing. It reminds people of 7-Card Stud, but once you get into the game play, you will see that there are distinctions considered unconventional for the regular poker action. This game differs in several aspects, including the number of cards being dealt per hand, the ways in which hands are ranked – only in specific cases, not all rankings, and the game pace. Namely, unlike poker, the players here are able to savour the action a while longer, while at the same time thinking for the best possible move and card combination. As long as you put your bet before any cards are dealt, and it’s within the minimum and maximum amount, you should be good to go. Pai Gow Poker is played with a standard 52-card deck and a single Joker. During game play, each player is dealt 7 cards in total, allowing players to make two hands, one containing five cards and the other containing 2. The five-card hand is also known as high-hand, or ‘behind’, while the 2-card hand is known as the low hand, i.e. up-front.